Banjo friction pegs were used to tune the instrument in its earlier days. As steel strings became more popular and machining techniques improved, friction pegs gave way to machine tuners. Today we still see friction pegs used on violins and cellos. The high tension of steel banjo strings make the friction peg a sub-standard option for modern banjos. However, if you are into playing nylon strings at low tension, the friction peg is still a viable option for tuning your banjo. I use friction pegs on gourd banjos. What is a Friction Peg? What is a friction peg anyway? How does it work? A friction peg is usually made from ebony, rosewood, or some other hard wood. The peg is evenly tapered along it’s length. Since the peg is tapered, the inside of the hole that the peg fits into (in the peghead) must also be evenly tapered to match the peg. The taper for most pegs and holes is about 5 degrees. The matched taper of the peg and hole is what makes a friction peg able to work. When the peg is inserted in the hole, the fit should be so close that gentle pressure will make the peg stick. A close fit is essential for friction pegs to work properly. In order to make a peg and peghole that match closely one needs a tapered peghole reamer and a tapered peg shaper. If you have a reamer, you can make your own shaper. This guy has a pretty good way to do it. Here is what a peg reamer looks like up close. These are the same type of reamers used for violins and fiddles. Before you can ream the hole, you need to drill a straight hole in the peghead. The straight hole should only be as large as the smallest end of the peg. The thing to remember about reaming is that you should never stop turning the reamer in the same place twice, this will result in a flat spot inside the hole. 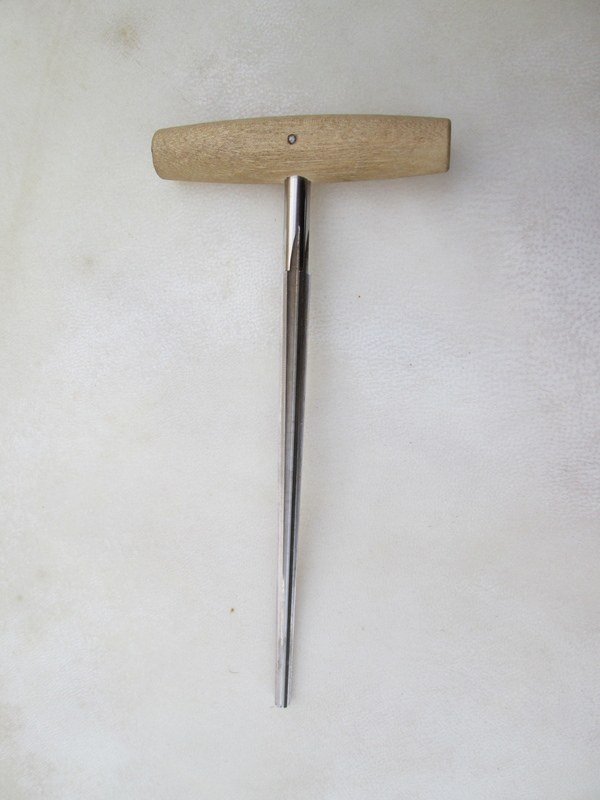 Here is a single flute peghole reamer used to taper the inside of the peghole. If the fit between the peg and hole is uneven, rough, or just not very good, the peg will either slip too much or stick to much. Neither of these is good. You want a friction peg to turn when you are tuning, and to stick and hold fast when you get the string up to pitch. When new pegholes are reamed, they often need to be conditioned. A newly tapered peg in a newly tapered hole will often stick too much to use. I generally use a combination of soap and chalk to condition new pegs. The soap is used if the peg needs to slip more and the chalk is used if the peg needs to slip less. Introduce the soap into the peghole by rubbing the peg gently against a cake of dry bar soap and then inserting it into the peghole. The soap will fill in the wood grain on the inside of the peghole. Be very sparing with the soap. You want to add just enough soap to the inside of the peghole to allow the peg to slip some but not too much. You can tell when a peg slips smoothly just by turning it without a string on it. To determine if the peg will hold tune, it needs to be tested by stringing it up to pitch. If the string slips when tuned to pitch, the peghole may have too much soap in it. To fix this, remove the peg and use a piece of damp rag to scrub some of the soap out of the peghole by twisting the rag into the hole. Wipe the shaft of the peg to remove soap from it too! Follow the damp rag with a dry one. Then, reinsert the peg and string to pitch again. If the string still slips, try removing more soap from the peghole. If the peg still slips after a second round of this, it will be time to try the chalk. Add chalk to the peghole in similar manner as adding soap previously. Use the chalk to mark on the shaft of the peg. Then, reinsert the peg into the peghole and give it a few turns. Then, string to pitch. If the peg still slips, repeat this step until the peg sticks as demanded by the tension of the string. If you are not able to achieve the performance you need, you may wish to consider re-reaming the peghole, reshaping the peg, or both. A properly fit and conditioned set of friction pegs will generally perform very well for a number of years before needing any attention in the way of maintenance. However, over time, pegs will wear out and begin to slip. In the long run, this is usually due to small changes in the shape of the peg or peghole due to use. Reconditioning is a good step to try before replacing friction pegs. Sometimes changes in temperature or humidity can change the way a peg performs. Reconditioning can help this situation. To recondition just follow the same process as for conditioning a new set pegs, described above. Be sure not to get the pegs mixed up. Be sure that each peg goes back into the same hole it came out of. In the case that reconditioning does not help, it may be time to replace the pegs. 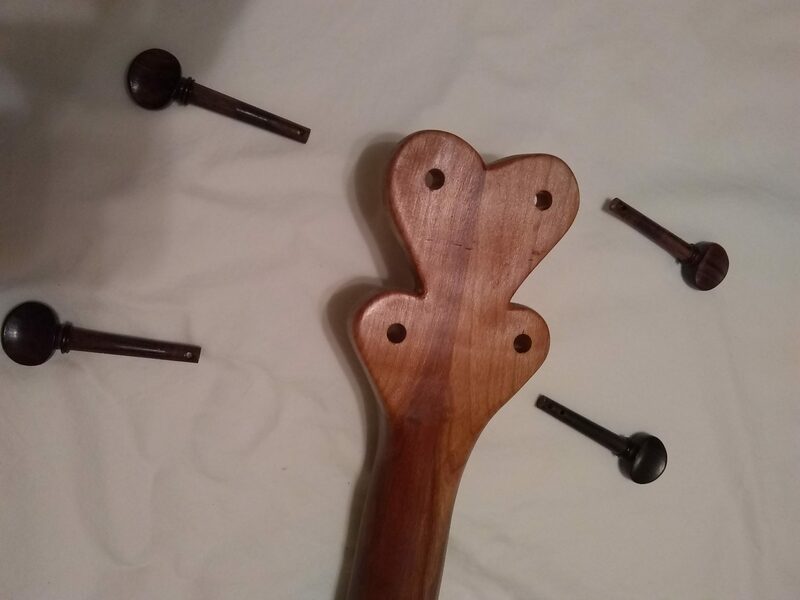 In order to do this job right, the peg holes will need to be re-reamed and new pegs shaped. This is a pretty easy job if you have the tools, but if you’re not up to it, most any violin repair person can help. Re-reaming will make the pegholes just slightly larger, the pegs too will need to be slightly larger. In cases where the pegs have been re-fit on multiple occasions over the years, the holes may have gotten so large that reaming yet again is not a good option. In this case, the pegholes will need to be bushed (filled with a tapered stick that is glued in). Then, the holes can be re-drilled and fitted with new pegs. Where can I buy a fifth string friction peg? Are you building from scratch or looking for something to fit an instrument that is already built?